We give educators, service providers, and families tools to prepare them to educate, support, and care for individuals with autism and intellectual and developmental disabilities. Bookmark this page and make return visits to watch for new types of learning opportunities. How does this learning work? Select a Vanderbilt Kennedy Center doorway and explore your learning choices. Register (first time) and log in (subsequent times) to complete your learning module. Para español llame al 615-875-5083. You will receive a certificate to verify that you have successfully completed a learning module. 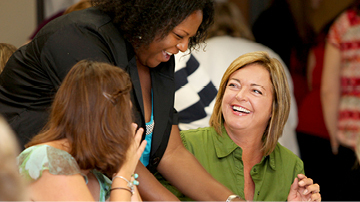 TRIAD’s Online Professional Development Opportunities for School Age and Early Childhood Services are offered through a collaboration between the Vanderbilt Kennedy Center TRIAD and Tennessee Department of Education. TRIAD offers quality, current information via webinars and brief online training sessions to professionals across the state, as well as members of our community, families of individuals with autism and self-advocates, with the aim of creating a more inclusive environment for all. The UCEDD provides training for university students, practicing professionals and direct care providers, individuals with disabilities and family members, disability advocates and policy makers. Currently, view modules on health care for adults with disabilities. Coming soon are Tennessee Disability Pathfinder modules on navigating service systems and multicultural resources.